If candor is a measure of success, then Daum has certainly written something. 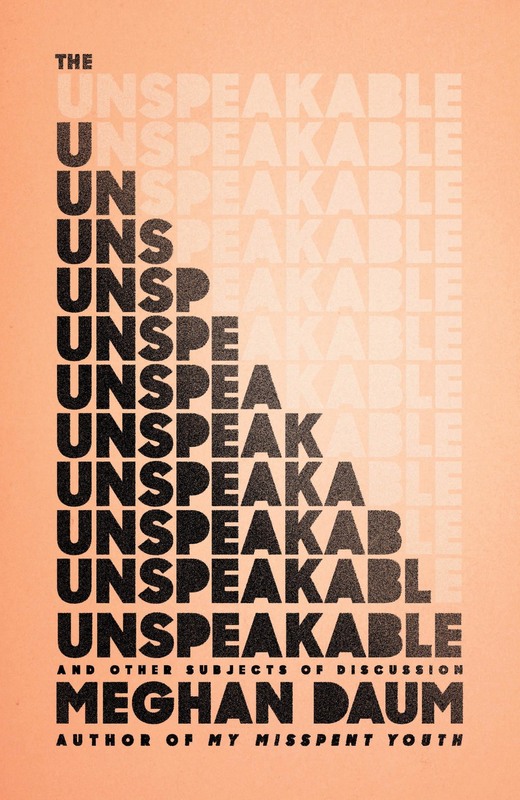 The Unspeakable: And Other Subjects of Discussion opens with Daum’s life-long irritation with her mother and her ambivalence toward her mother’s untimely death. Daum and her mother repeat a cycle: Daum’s mother detested her own mom and was too, physically repulsed by the woman that gave her life. Daum examines her thoughts, reactions, beliefs, and inclinations around relationships, family, and stereotypical gender roles. Daum is neither martyr nor saint and her essays are interesting precisely because she’s willing examine herself and her own (sometimes ham-fisted) actions to uncover the truth about herself. The Unspeakable is both harrowing and hilarious. For my mother’s entire life, her mother was less a mother than splintered bits of shrapnel she carried around in her body, sharp, rusty debris that threatened to puncture an organ if she turned a certain way. To try to explain to a 13-year-old the importance of leaving a callback number is essentially to bathe yourself in sepia tint. I found myself relating to Daum on more than one level. She connects more easily with dogs than humans, for one, (Hello, sister from another mister.) but I found myself nodding yes as she shared her struggle to be ok with not having children. She, like me, wanted to want to have kids, but eventually realized that not having them was the right choice for her. Our reasons differ, though it’s refreshing to read about how someone else came to a similar realization in a world so obsessed with child-rearing.